Nintendo's latest ad for Super Mario Odyssey, "Jump Up, Super Star!" is a catchy mix of live-action and video game play that's sure to please video game fans everywhere! The upcoming Nintendo Switch game Super Mario Odyssey promises to be a 3D platform game focused on exploration. 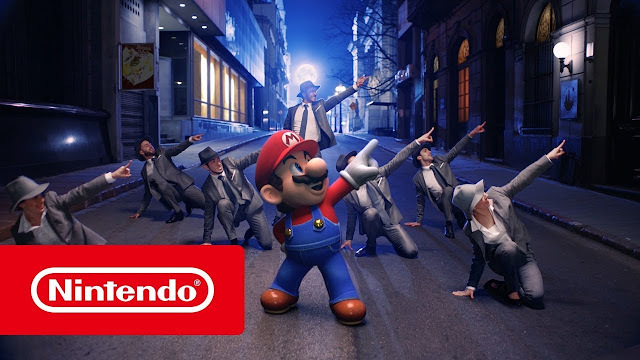 And just like how the game looks to bring Mario's world into our real lives, an accompanying trailer for the game does the same where the famous plumber shows off his best moves alongside a real life dance troupe. Listen up for some deliciously nerdy lyrics (see below) that longtime Mario fans will appreciate. Chicago based, advertising agency, Leo Burnett, asks fans to join Mario and Cappy as they dance through the streets of New Donk City and embark on an all-new, massive, globe-trotting 3D adventure! Super Mario Odyssey is available on Nintendo Switch on October 27, 2017! Say the word I’ll be there in a flash! You could say my hat is off to you! From this great wide wacky world! It’s time to jump up in the air! Jump up, don’t be scared! Just jump up and your cares will soar away! I’ll be your One-Up Girl! No one else can take me this far!